Kung Fu offers women a means of training of body, the mind and the spirit. The body is healthier through increased activity. The mind is more peaceful because you can be more self-confident of your abilities and limits. Enlightenment is achieved through quiet contemplation of your own self. Chinese martial arts are an unique form of activity in that it combines all three elements. This importance of this activity was recognized by heroines in the past and can still play an important role for the heroines of the future. We at Australian Hung Kuen Kung Fu firmly believe that women of all ages can benefit from proper training in the Chinese Martial Arts. It is not only the pursuit of worthwhile physical activity but there are also enjoyable social benefits to be had. 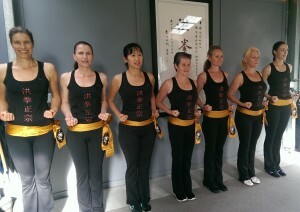 With post grading Yum Cha’s each student has the chance to experience cultural aspects of Kung Fu.